Professional Maintenance Services in London. You probably are not aware about the quantities of dust mites and other harmful germs residing in your mattress, but the truth is there are millions of them feeding on the dead skin cells which flake of us continuously. This is why Thomsons Cleaning offers professional mattress cleaning in London and the area. The cleaning company provides a highly efficient domestic and commercial mattress cleaning, which is very suitable for hotels, hospitals, hostels and any place with beds. The professional mattress cleaning is all chemical-free, safe and will make your bed and the air in your bedroom clean and healthy. This is especially important for people with dust allergies, asthma and other respiratory problems. To obtain a free and non-obligatory price quote for the mattress cleaning, or for a combined cleaning service, simply call the 24/7 customer care service or send an online request. You will receive a mattress cleaning price as soon as possible. 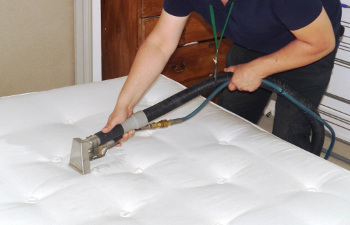 Thomsons Cleaning offers both dry and steam cleaning of mattresses for private and commercial customers in London. The cleaning methods are all highly efficient for killing the germs and mites in your mattress, and helping for the removal of all nasty allergens in your bedroom. The professional mattress cleaning will also kill and remove fungal spores, microbes and other harmful debris which can cause problems for people suffering from allergies, asthma, eczema and other health issues. The cleaners can also efficiently kill and remove bed bugs safely and permanently. The UV cleaning of your mattress will be done with special high intensity UV light which kills 100% of the germs. There are benefits of this type of deep cleaning apart from the fact that it is very efficient in killing the germs in your bed and removing them. Some of the benefits includes the fact that this method requires no drying time or moving of the mattress. Since no water is used, there is no danger of moisture penetrating the mattress and ruining it or causing fungal growth or mildew to appear. Also, this professional mattress cleaning method has a 72 hour residual effect and keeps killing the allergens 3 days after the cleaning has been performed. It also helps neutralise any unpleasant odours from your mattresses. One mattress can be cleaned for just 14-16 minutes! These professional cleaning methods are also offered for customers who want their mattresses actually washed and cleaned. The steam cleaning utilities water and a safe and all-natural detergent for washing the mattress. Although a powerful water extraction machine is used, some dampness remains after the washing, so it requires drying time in preferably a well-ventilated room. The dry mattress cleaning method requires no drying time, and a special dry cleaning solution is used to kill the bacteria and remove any residues. Along with the mattresses, you can book a deep cleaning of your carpets, curtains, draperies, sofas, upholstery and other cleaning services. The more services you book - the better the price offer you will receive! Booking a cleaning session is free, no deposit is requires, so you will pay after the service has been provided. To book your mattress cleaning service, just call 020 3746 0000 or send an online booking request. The 24/7 customer care service will return to you with a written confirmation in less than 2 hours. If you book more than one cleaning service, you will get a very serious discount from the prices of the services. Regular customers also will receive preferential prices. You can book your mattress cleaning for the same day, or for any other day of the year. There is no extra fee for booking the service for weekends or bank holidays.